FANN’s Nominating Committee has proposed a new face for our board this year: Nursery Manager Patty Caballero from The Natives, a 36+ year native plant nursery and restoration firm and FANN member in Davenport, Florida. Owners Bill & Nancy Bissett are founding members of FANN and past board members. Patty has followed a not-uncommon irregular path to her career in native plant horticulture. She received a Bachelor of Fine Arts from Maryland Institute College of Art, with a minor in Ancient Art History in 2000. After a decade-long stint selling residential real estate in Lake County, Florida, through the 2008 recession, and disheartened by the over-building of developments and rapid urban sprawl encroaching natural areas surrounding greater Orlando, Patty made a career change in 2014. She started as volunteer, and later as preserve management intern, at the Disney Wilderness Preserve for The Nature Conservancy. Patty assisted with surveying, mapping, treating invasive plants, as well as prescribed fire. She learned several aspects of the preservation and restoration of natural habitats in the Central Florida area. In 2015, Patty maintained the Florida native gardens installed at Bok Tower Gardens by The Natives. Her curiosity and enthusiasm for native plants solidified as she cared for wetland, wetland prairie, flatwood, and sandhill species maturing in that patch of the gardens. Patty is a native of Peru, from where she immigrated as a teen. 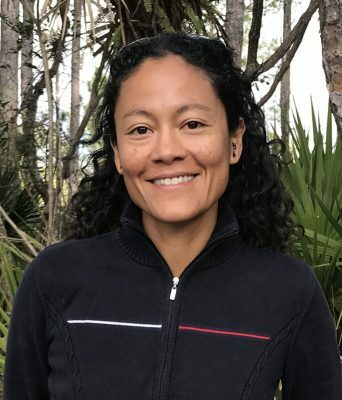 She is an energetic trail runner and mountain bicyclist, spending most of her spare time chasing single track trails through central FL’s state parks, preserves, and wilderness management areas. Patty has wisely spent a couple of years hiking and backpacking through parts of Central America, Western Europe, and Southeast Asia; mainly to see how the other half lives and manages their natural lands. She brings with her a broad range of experiences and an all-inclusive frame of reference. Patty interprets that in order for our pursuits to thrive we must eagerly invite and welcome our diverse audience to become our colleagues, leaders and employees.